Two decades later, the men convicted in the slayings argue that prosecutors unfairly inflamed the emotions of jurors and pressured them to resolve the horrific crime. The convicts, who are serving life sentences, also argue that prosecutors used airline flight records that were never authenticated to convince the jury that the men fled the country because they committed the crimes. Siny Van Tran and Nam The Tham are asking the state’s highest court to overturn their convictions and grant them new trials. Their appeal will be argued before the Supreme Judicial Court next month. The killings on Jan. 12, 1991, stunned Boston, particularly residents of the city’s close-knit Chinatown neighborhood, where the men were shot while playing cards. Prosecutors said three gunmen entered the club before dawn, announced a robbery, and ordered the patrons to put their hands behind their heads. Six men were shot in the head at such close range that gunpowder residue was found on their clothing. One of the six survived and became the prosecution’s star witness. It took years to find Tran and Tham, who grew up in China and returned there after the killings. They were brought back to Boston in 2001 after being arrested in China on unrelated charges. A third suspect, Hung Tien Pham, has not been found. Lawyers for Tran and Tham say they were convicted on little evidence, mainly through the testimony of two witnesses who gave conflicting descriptions and accounts of the shootings. Tham’s lawyer argues in his appeal that the trial prosecutor pressured the jury to convict the men by referring to the crime as one of the worst in Boston’s history and telling jurors they would write the final chapter of a story that then spanned nearly 15 years. “The prosecutor’s theme improperly conveyed a false picture of personal obligation to bring closure after 15 years of government effort, driven by harm of historical significance to the Boston community,’’ Tham’s appellate attorney, Robert F. Shaw Jr., argues in his appeal. Tran and Tham say prosecutors should not have been allowed to show the jury airline records indicating that Tran, Tham, and the third suspect flew together to China about three weeks after the killings. The trial judge had rejected the records, but a single justice of the state Supreme Judicial Court reversed the ruling right before lawyers were scheduled to make closing arguments. The documents, which included photocopies of a portion of the passenger manifest and ticketing records, were identified during the trial by a United Airlines employee who did not work for the airline at the time of the 1991 killings. 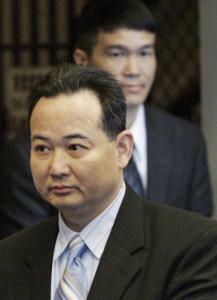 Defense lawyers for Tran and Tham argued that the records were not authenticated because the employee did not produce the documents and had no knowledge whether the information was from data stored on United Airlines computers. The employee testified that at the time the tickets were purchased — a decade before the Sept. 11, 2001, terrorist attacks — the airlines did not check the identification of passengers. Lawyers for Tran and Tham argued that even if the records were considered reliable, they did not prove, as prosecutors allege, that the men fled the country because they had committed the killings. “The Commonwealth offered no evidence that Mr. Tran knew that the police were pursuing him, that he was abruptly leaving his family and employment, or that his trip to Hong Kong was anything other than a visit to his family in China,’’ Tran’s lawyer, Janet Pumphrey, argues in the appeal. Prosecutors, however, say the United Airlines employee pointed out indicators that established that the tickets were issued on behalf of United Airlines, including the ticket number and a UA code. “Here, the jury could rationally conclude that the documents were United Airlines business records based on [the employee’s] testimony and the documents themselves,’’ Assistant District Attorney David McGowan argued in his written opposition to the appeal. Police initially said the killings appeared to be part of a dispute between rival gangs vying for control of Chinatown’s gambling rackets. During the trial, prosecutors offered little detail on the alleged motive, but noted that one of the shooters said it was a robbery. The survivor, Pak Wing Lee, testified he was one of eight people playing cards that night when three men he knew from the neighborhood came in with guns. He said he heard five men being shot after pleading for their lives, then felt a gun on the back of his head. He was shot in the head, but the bullet did not penetrate his brain. The five men killed, all Chinese nationals, were: Cuong Kand Luu, 26; Man Cheung, 55; David Quang Lam, 32; Chung Wah Son, 58; and Van Tran, 31. Oral arguments in the appeal are scheduled for Feb. 11.